The Acting Prime Minister, Grand Chief Sir Leo Dion opened the reconstructed Kumusi Bridge in Oro Province today. It is the longest, which is about 285 meters in length, double lane bridge in the country. It was reconstructed at a cost of K139 million and was funded by the Australian Government through the Transport Sector Support Program (TSSP). 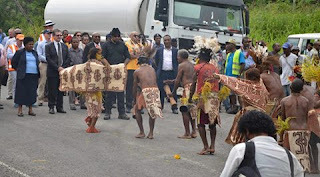 Sir Leo said it will connect more than 100,000 people in the Sohe District and along the famous Kokoda Track area of the province. “The bridge is a significant milestone which signifies our long and mutually beneficial bilateral relations with Australia that dates back to the heroic days of the Fuzzy Wuzzy Angels of World War 2. “I want to acknowledge the Australian Government for their continued support and assistance in rebuilding the bridge. “I want to convey and express our utmost gratitude and appreciation to the Australian Government for the funding to the tune of K139 million and the expertise by the Australian Government’s International Aid Agency (AusAid) for the project and other projects under the Transport Sector Support Program. “What we are witnessing today is the result of good working partnership between the National Government, Provincial and Local Level Governments working together with our donor and development partners like AusAid to deliver infrastructure projects like this bridge that will serve our people. “This is truly a milestone in bridge construction and structures in our country and an engineering spectacle that we should be proud of. "The successful completion of this project gives us confidence for future partnership under this government proposal to challenge our Australian and New Zealand friends to build a new ANZAC Highway along the Kokoda Track to connect Port Moresby. “This project is subject to further high level bilateral talks with our two friends,” said Sir Leo. He said it will serve over 100 000 people of the Sohe District and boost tourism development associated with the Famous Kokoda Track and agricultural activities. “This Government is investing a lot in infrastructure as the catalyst for economic growth and prosperity right around the country. Sir Leo said the opening of the Kumusi Bridge is both a blessing and gift from the government and people of Australia to the people of Oro and Papua New Guinea to further strengthen the bond and friendship between the two countries since World War 2. “Today the people of Oro; it’s your turn to realize the commitment that this Government is providing to you and your children's future. He also reminded those who gathered to witness the opening to remember those who died during disasters like Cyclone Guba that destroyed and hit Oro province in 2007. “Nature has not always been good to us and Oro Province has had its share of natural disasters like Cyclone Guba that destroyed properties like the old Kumusi river bridge. “While we gather here to witness the new two lane bridge opening lets pause and remember those who died during the disaster whilst trying to cross the Kumusi river and from lack of food and health care,” he said. The 285 meters double lane Kumusi Bridge was constructed within two years using one thousand tonnes of steel. It is one of the four bridges that were reconstructed with financial assistance from AusAid after it was destroyed by Cyclone Guba in 2007. The other three are Girua, Eroro and Embogo. The Acting Prime Minister thanked the Australian Government for funding the reconstruction of these four bridges.